ROLEX / Daytona "The Unicorn". Ref.6265. Manual-winding（Cal.727）. 17jewels. 18KWG（Diameter 37mm）. Circa 1970. Sold for CHF 5,937,500. A recap of the spring Geneva auctions cannot but begin with the Phillips "Daytona Ultimatum" sale,a 32-lot theme auction curated by Italian author Pucci Papaleo, who has worked with Aurel Bacs for years on thematic auctions. Despite the small number of lots offered and generally good condition of the watches, the final results were lower than pre-sale whispered expectations, especially from hopeful dealers and collectors with skin in the game. The unique white gold Ref.6265, sold by the renowned scholar and collector John Goldberger to benefit charity, was hammered down at its pre-sale private guarantee of CHF 5million (with buyer’s premium CHF5,937,500). Two other most probably put-together "unicorns"with so-called "prototype" dials, previously published in Pucci’s Daytona book and given comical names in the likes of "Arabian Knight" and "The Neanderthal",both narrowly escaped failing to reach their reserves (or low estimates), fetching, respectively, CHF1,932,500 CHF3,012,500. Marketing and hype aside, these are still very big numbers, especially considering the fact that the dials are not indisputably correct and most likely were not born in their present cases. Taste aside, my preferred two picks of this sale for their originality and condition are the Ref.6263 “RCO”originally published in John Goldberger’s 2008 "100 Superlative Rolex Watches" book and the gold Ref.6239 with exotic dial, which sold for CHF1.66 million and CHF948,500 respectively. ROLEX / Daytona. Ref.6239. Manual-winding（Cal.722-10）. 17jewels. SS（Diameter 36mm）. Circa 1969. Sold for CHF 951,000. 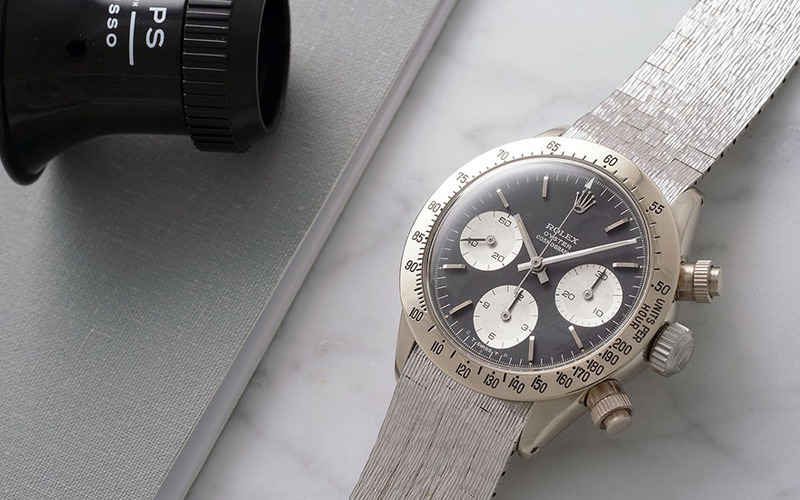 The top lot of the otherwise uneventful Sotheby’s spring Geneva sale was yet another Daytona: a steel Ref.6239 with exotic dial, supposedly consigned by the original owner. The watch stood out due to the brown-turned sub-dials. The thirst of a tired market for fresh examples and a dial that stands out in any way among thousands of "Paul Newmans" saw this watch finally sell for CHF951,500. The now ubiquitous Ref.6263 "Oyster Paul Newman" on the cover of the Christie’s Geneva catalogue failed to sell against its ambitious pre-sale low estimate of CHF600,000. A mediocre-condition but otherwise beautiful steel Patek Philippe Ref.1463 with Breguet numerals dial from the same sale sold for CHF504,500, and a steel Ref.130 with sector dial for CHF324,500. 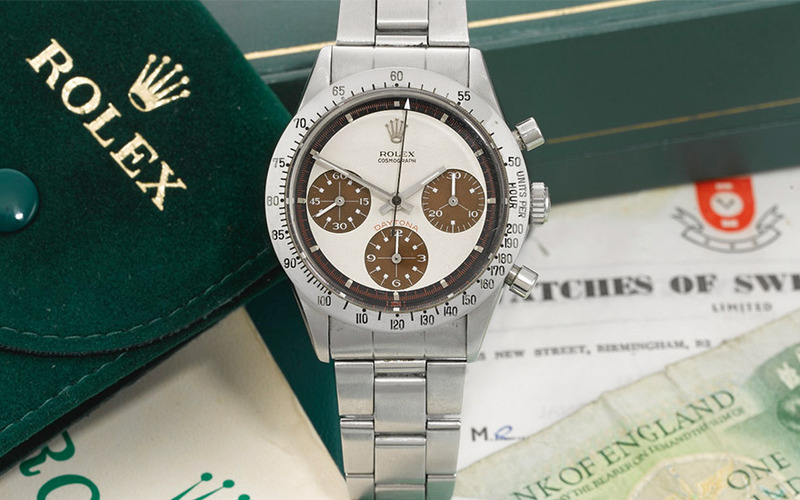 Within the context of rarity and quality, the insanity of current prices for Rolex Daytonas is quite obvious. 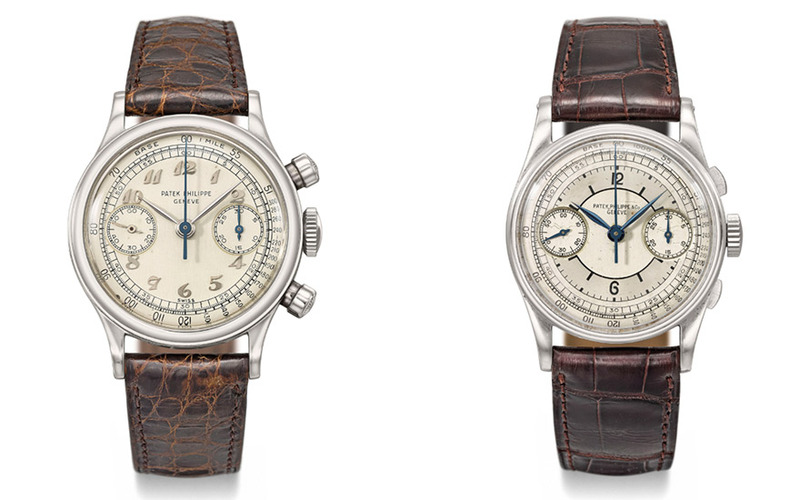 As a collector and observer of the market, I have lately often wondered how much longer such prices can persist for a mass-produced chronograph most often found with swapped dials, if not other parts. What will happen to the market when the "coolness" of the Daytona fades and trends change? In due time, a correction is almost a certainty after such a wild and extended move. LEFT/ PATEK PHILIPPE. Ref.1463. Manual-winding（Cal.13'''）. 23jewels. SS（Diameter 33mm）. Circa 1951. Sold for CHF 504,500. RIGHT/ PATEK PHILIPPE. Ref.130. Manual-winding（Cal.13'''）. 23jewels. SS（Diameter 33mm）. Circa 1938. Sold for CHF 324,500. Left/ ROLEX "Stelline." Ref.6062. Automatic-winding（Cal.9 3/4'''）. 19jewels. SS（Diameter 36mm）. Circa 1953. Sold for CHF 1,452,500. Right/ROLEX "Stelline." Ref.6062. Automatic-winding（Cal.9 3/4'''）. 19jewels. 18KYG（Diameter 36mm）. Circa 1952. Sold for CHF 636,500. After the almost anticlimactic Daytona Ultimatum sale, the Phillips Geneva Watch Auction 7 went by without much of a splash. 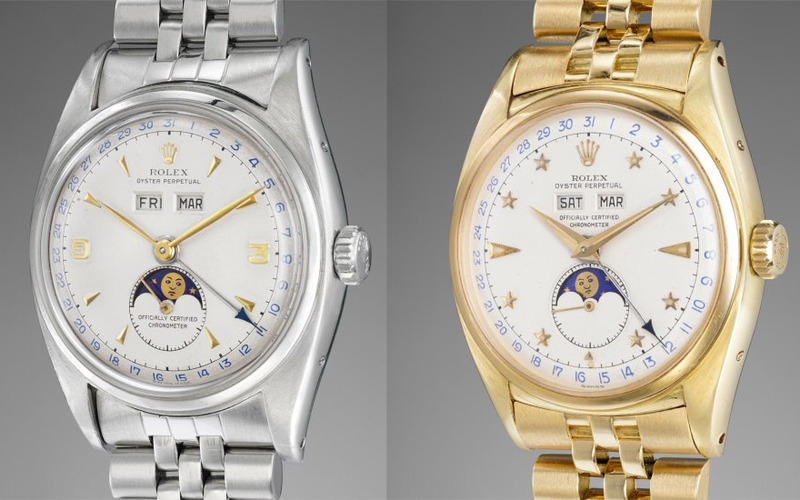 At the top of notable Rolex lots were two Oyster Moonphases Ref.6062: an interesting steel example with "OFFICIALLY CERTIFIED CHRONOMETER" printed below the moon (in contrast, most are found with this text immediately below calendar windows, making the dial aesthetically less balanced), and a yellow gold "Stelline." 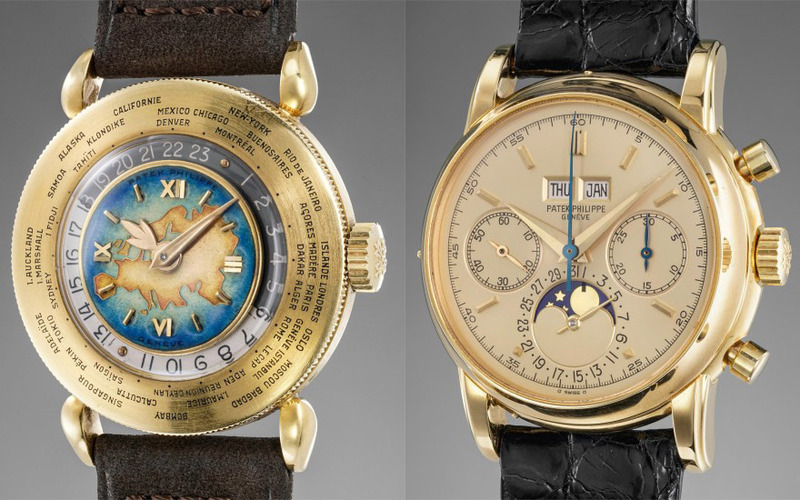 The two watches sold for CHF1,452,500 and CHF636,500. Beauty is in the eye of the beholder,but in terms of rarity and importance,these are arguably greater buys compared to any Daytona. The top Patek Philippe lots of this sale were a fourth series Ref.2499 with champagne colored dial (CHF1,572,500), and a Ref. 1415 world time with cloisonné enamel Eurasia map dial (CHF972,500).A unique steel Lange jumping center seconds "Homage to Walter Lange" made solely to benefit charity sold for a whopping CHF852,500. Left/ PATEK PHILIPPE "Eurasia". Ref.1415. Manual-winding（Cal.12-120HU）. 18jewels. 18KYG（Diameter 31mm）. Circa 1949. Sold for CHF 972,500. Right/ PATEK PHILIPPE. Ref.2499/100. Manual-winding（Cal.13Q）. 23jewels. 18KYG（Diameter 37.5mm）. Circa 1979. Sold for CHF 1,572,500. From the eyes of a jaded collector, the selection offered this spring was relatively boring. There were no mega wristwatches such as the Rolex Ref. 6062 "Bao Dai" or steel Patek Philippe Ref.1518, nor any important complicated or miniature enamel pocket watches. Out of the thousand-plus lots offered in Geneva, the watches that genuinely piqued my interest numbered fewer than 5, and the only watch I deemed worthy of adding to my collection, funds permitting, was the steel Ref.6062 with OCC printed below the moon. International connoisseur and collector of important wrist and pocket watches.